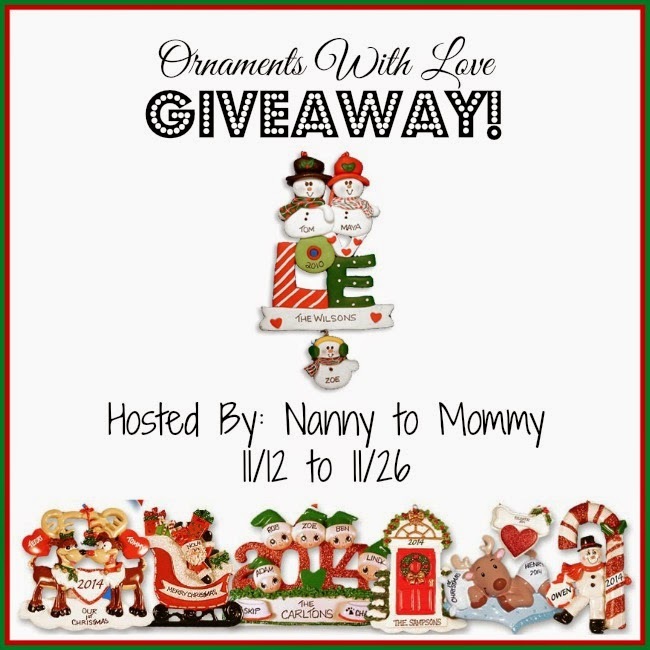 I received free products from Ornaments With Love to provide this review/giveaway. All opinions are my own. I am so excited to include Ornaments With Love in my 2014 Holiday Gift Guide. I was very excited when I was contacted by Ornaments With Love to review one of their beautiful handmade ornaments. I have seen these ornaments reviewed by other blogs so I couldn't wait. I had a very hard time picking which one to choose. After going back and forth with OWL, I had to get a replacement order and decided on the Baby's 1st Christmas for Peanut. I originally wanted a family of four 2014 ornament, but my order was misplaced or something so I was kind of upset about that. I am happy with the ornament I did receive though. I think it is well crafted and beautifully made. You can tell it was personalized by hand and I love that touch about it. Their ornaments are the very best available from multiple suppliers. The ordering process is quick, easy and user friendly. Orders usually ship within 1 to 2 days, but make sure to place orders early to avoid seasonal delays. 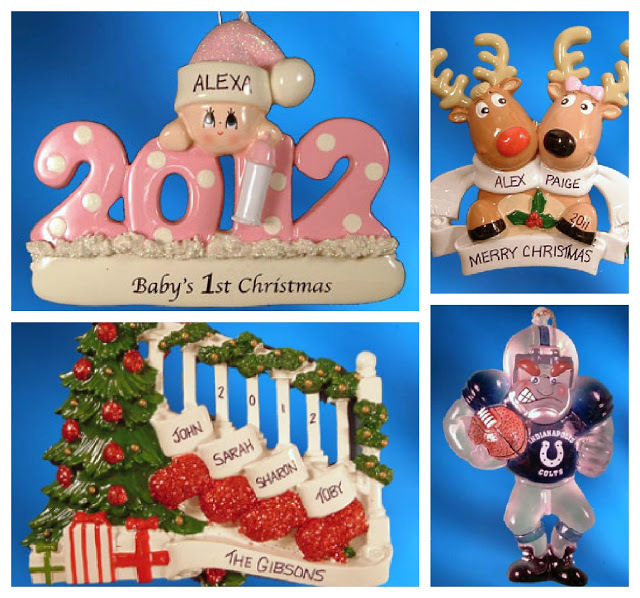 At Ornaments with Love personalizing is free and "Order Processing & Customer Care" is their #1 Priority. The ornament I ordered is $14.99 (which most are) and then shipping is a little high at $6.95 but it's the same with however many you order and FREE shipping with orders over $50! So this ornament would have been $21.95 which I actually think is a great price because it is handmade and I love it. I'm excited because Ornaments With Love has graciously offered one very lucky Nanny to Mommy reader the opportunity to win a personalized ornament of their very own. Entry is simple, just follow the prompts on the Rafflecopter below! Click HERE if you are having issues loading the form below. Welcome to the Thankful For Giveaways Hop! Hosted by The Hopping Bloggers & Up All Night Blogging! 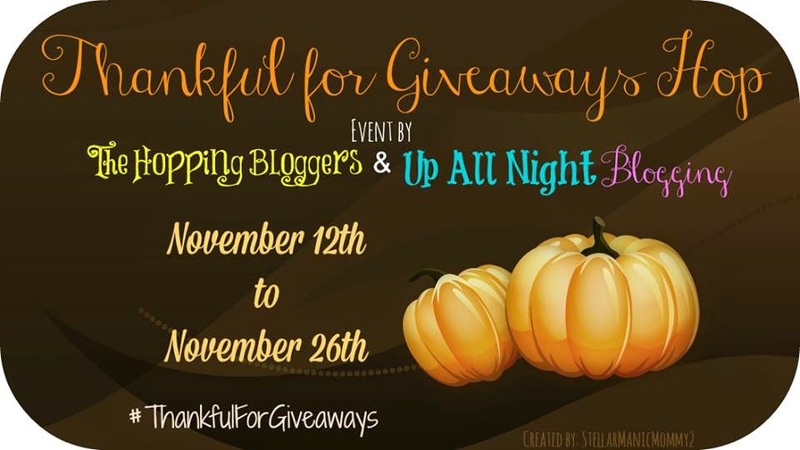 I have teamed up with a great group of bloggers that specialize in giveaway hops - so stay with us and you will have many chances to win some amazing prizes! Each blogger participating in this hop has a giveaway with a prize value of at least $15 - and some are much more than that! Be sure to visit them all - there is no limit to how many prizes you can win! Good Luck and Have Fun! Nanny to Mommy received complimentary products to provide this review and share this giveaway. No monetary compensation was received. All opinions are our own. Nanny to Mommy or participating bloggers are NOT responsible for sponsors who do not fulfill their prize obligations. No social media was involved in this giveaway in ANY way. This giveaway is open to US and Canada, must be 18+ to enter. Winner is chosen via Random.org, ALL winning entries ARE verified. Winner will have 48 hours once notified to respond or another winner will be chosen. If you have any questions about this giveaway or would like to see your product featured in our Holiday Gift Guide, please contact Diana.n.chastain@gmail.com. Thank you and Good Luck! I would love to have the personalized Blue and White Snowflake Family Christmas Ornament 6 people and one pet. It is so cute!! Tough to decide, but would definitely be a family one. I love the 2014 family of 4 ornament! My husband and I have one of these from the year we got married. I want one that would include the whole family now, including the dog! I just bought a personalized ornament for my son's family, so I would choose one of the Extra Large Family ornaments, probably one of the trees. We have 10 kids, plus my husband and I, and I'm thrilled to see a place that carries ornaments that work for us. I would get Baby frame with stars - blue, I'd love to have an ornament for my daughter's 1st Christmas. I would choose the Fireplace - Tabletop Decoration for a family of 3. My husband and I have always made it a point to get an ornament each year of our relationship, to signify something for that year. This ornament would signify that the moments together in front of the fire together, were the most important to us because of how few they were with my husband's new job. 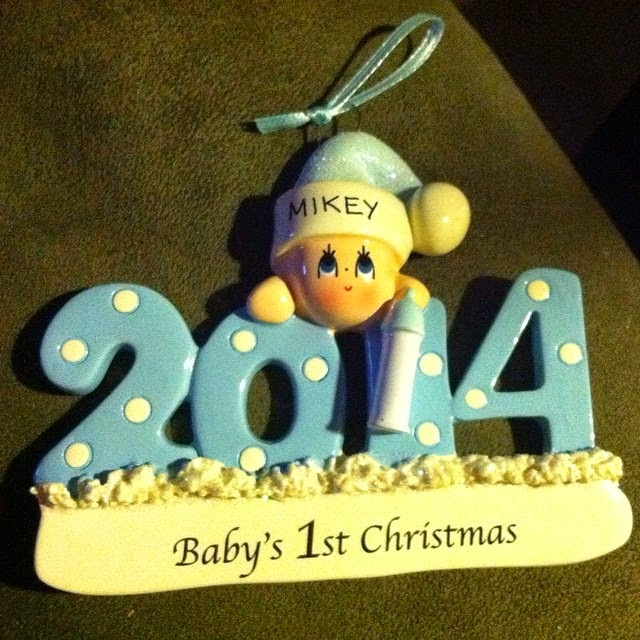 The ornament that I would choose is the Personalized Family Christmas Ornament - 1 Child and Baby. I like the Personalized Church Christmas Ornament. I would put it on our Church Christmas tree, They have so many nice ornaments. If I won the giveaway I would choose the Rocking Horse with Teddy- Pink. From Ornaments With Love, I would love to get the Vacation Log Cabin with Wreath because we have a small log cabin! I would pick the minecraft ornament for my son who loves minecraft. Oh I would love to get the Personalized Bowler Male Holding Ball Christmas Ornament with Blond Hair! Our little bowler would love that on the tree! I would chose the san jose sharks ornament because it is the only sport my boyfriend watches! I really like the Camper with Bears for 3 people. I would choose the Personalized Fan #1 Christmas Ornament for a female. Awesome for a huge sports fan. i would pick the grandparents ones! I would choose the Back Hoe with Dirt for my grandson, Nolan. I would personalize the Army Uniform Blue Christmas Ornament - Male in honor of my father. I like the angle with star Ethnic. I would love to have the Personalized 1st Christmas Christmas Ornament Snowperson - Blue! I would choose the Personalized Just Married! Christmas Ornament! I just got married six months ago! I would choose the 2014 family of four with two dogs ornament. I would get my son one of the Minion ornaments! I'd love to get the Candy Cane Family with 1 Pet ornament! My choice would be the family with two kids and a baby! Perfect for our Christmas this year! I like the family with two kids and a baby ornament! Perfect for our growing family. There are so many that I love! I think I'd choose the Personalized Snow Couple Christmas Ornament with 3 Pets to show our "family." I like the Personalized Christmas Mug Ornament Christmas Ornament for our family of four. I like "Al Roads lead Home" ornament. It is a great ornament. I would love to have the Book Lover ornament. I love books. We have collected an ornament every year since my husband and I met. Which started in 1978. So I can decorate a tree with all of the ornaments from each year. So I like family ornaments, I prefer ball or round ornament, but I found the ornament you have the Personalized Candy Cane Family with 4 People Christmas Ornament and I think I would like to have this one. I would choose Baby's First Christmas for our new grandson. Personalized Angel Tree Christmas Ornament with 7 Angels and Glitter - would look so great on my mantle. I would choose Personalized Beach Family Christmas Ornament with 1 Children. I would chose Personalized My Grandma Christmas Ornament is My Special Angel. I like the black camera ornament the most! It's hard to decide since there are so many great ornaments! I think my favorite is the Personalized Noah's Ark Christmas Ornament with Brown Ark (personalized for my little girl's 2nd Christmas). I would choose the Personalized 2014 Couple Christmas Ornament with 2 Pets! I love the Personalized Bichon Christmas Ornament (PA003), because it reminds me of my sweet pooch. I would love to have personalized the Bears with Hearts Tabletop.